Eddie Jones’ side got their title defence up and running in emphatic fashion. England celebrate Anthony Watson's try. 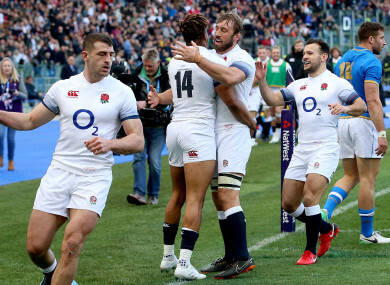 ANTHONY WATSON AND Sam Simmonds scored two tries apiece as defending champions England started their quest for a historic Six Nations title with a seven-try 46-15 thrashing of Italy at Stadio Olimpico. England were flummoxed by Italy’s no-ruck tactics at Twickenham last year, but it was the Azzurri who were left scratching their heads after the holders made a blistering start in Rome on Sunday. Pacy wing Watson claimed a brace inside 11 minutes and Owen Farrell added a third try after a superbly worked Tommaso Benvenuti score, but Tommaso Allan’s penalty reduced England’s lead to 17-10 at half-time. The champions suffered a blow when they lost scrum-half Ben Youngs early in the first half to a knee injury, but they had the bonus point in the bag when the impressive Simmonds claimed a bonus-point try on his tournament debut. Mattia Bellini scored a second Italy try, but Conor O’Shea’s men were unable to avoid a 13th consecutive Six Nations defeat, George Ford, Simmonds and Jack Nowell adding late tries as Italy tired. Farrell scored 11 points with the boot in what was ultimately an emphatic win for Eddie Jones’ side, aiming to become the first team to win the tournament outright three years in a row. Email “Seven-try England steamroll Conor O'Shea's Italy in Rome ”. Feedback on “Seven-try England steamroll Conor O'Shea's Italy in Rome ”.